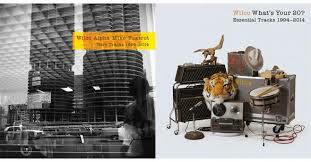 Wilco – Alpha Mike Foxtrot & What’s Your 20? Wilco is celebrating 20 years of being in business with two great anthologies: What’s Your 20? (a “greatest hits” package for a band who has never had a hit) and Alpha Mike Foxtrot (rarities). What’s Your 20? is a well curated collection of 38 of Wilco’s essential tracks. It is a nice introduction to the band. Even as a long-time fan I have enjoyed listening to it on Spotify – the ultimate Wilco playlist (that I did not even have to take the time to put together). Alpha Mike Foxtrot is 77 tracks: B-sides, demos, alternative versions and live cuts from across Wilco’s 20 year career. I have not listened to Wilco much over the last year and this collection sneaked up on me – I had no idea it was coming out until a couple of days before its release. I sometimes forget how much I love this band. This collection has me falling in love with them all over again. You get a great sense of the growth of the band from not particularly special alt-country band to pop experimenters to beatlesque power pop kings. In the end I am reminded they are brilliant pop musicians and Jeff Tweedy is a pop genius. They are on my top-ten list of recording artists. As far as I am concerned they are the American Radiohead. There are some great B-sides that you would have to have been a very dedicated fan to have in your collection (I have not been that dedicated). There are wonderful live cuts from all points of their 20 year career. There are fascinating alternative takes on essential tracks. Particularly enjoyable are Jeff Tweedy’s comments on the tracks in the booklet that comes with the collection. If you are a Wilco fan you must have Alpha Mike Foxtrot. If you are not, you need to check out What’s Your 20?